I am applying for the position of Lead Torturer in your Destruction League Headquarters. I have attached my resume and accompanying media for your review. I am going to have to put some of the photos enclosed into perspective. First off, I want you to know that despite the amount of blood in the first four photos, I am very well organized and neat individual. I cleaned that room up in less than twenty minutes and held another subject in there within the hour. I have a turnover rate of 15 victims per day, which I believe meets your postings requirement of 10 VPD. I am also a trained surgeon with 6+ years in hostile organ removal. My equipment needs are very minimal, as I like to work with my own tools. I hold the copyrights to seven devices, many of them designed for victims with higher pain thresholds and are well within Good Torture Practices. I have included a video with some of my freelance work. As you can see, the subject was able to clearly speak while being bored in twelve different locations by mini-drills (one of my creations). The meat hooks were specially designed by me to inflict the maximum amount of pain while reducing the tear on the skin. I am highly motivated and willing to work in any environment, and I am also incredibly independent. I normally work out a a refrigerated eighteen-wheeler, but I can accommodate to working in a more permanent environment. Supervision under one of the senior partners is preferred. If I am handed off to middle management I will not hesitate in flaying them. My references will be more than enough to help you make your consideration. Due to the nature of my work, most of these people know me by different names. The Crimson Death Squad knew me as Evisceraptor, while the Morgue Group put Flay Master on all my checks. Most places will know who you are talking about if you mention Percy, though. I've been having employment issues as of late. I wrote a series of these ridiculous cover letters to keep my mind off of things. I too know what it's like to write cover letter after cover letter after cover letter I'd write one like this, but I'd prolly send it by accident. That's why I save my creative stuff away from thew work stuff. Don't think potential clients would enjoy haikus or disembowelment stories. I sooooo like it! Last lines are simply great. It's wonderful because is damn realistic. Really, I can see "Percy" sending this letter. It's all written in a so serious language it makes think you that something similar could exist. "I am also a trained surgeon with 6+ years in hostile organ removal. " I am tempted to beg you to let me send this to my next would be job, hahah. Then again, I'm allergic to police. My favorite from a child was setting up four blenders and shredding extremities off of bullies at my school, and sending said extremities to their parents in a canteen as a Christmas gift. Who isn't allergic to the five-o? Also, the four blenders bit is hilarious. This is sick. Love it. Yeah, my Dexter viewing paid off, sort of. I needed a ridiculous name. Seemed to fit. Page 120Turn to page 120. It's written in the margins of every volume, in the blank pages at the front and back, over and over again, in shiny brown ink. Turn to page 120. Childish scribbles in a set of ruined books, I knew, the reason this encyclopedia was dirt-cheap at a yard sale. I didn't care: who needs a paper encyclopedia these days? I bought it because it was too good a deal to pass up, because I thought it'd make me look learned, academic. The encyclopedia aesthetic. And I did find it amusing to poke around in, scribbles aside: outdated information preserved in ink and paper, brief summaries of complex concepts, the occasional racist aside. An old encyclopedia is a world unto itself. And wherever there was once a white space the same message: turn to page 120.
Who wouldn't be curious? It takes minimal effort to find a certain page: you don't have to expect much of a payoff for that to be worth it. Of course I turned to page 120. The waste land behind the fire station is always silent. No birds sing there, and even the wild rabbits and feral cats avoid it. Weedy wildflowers nod their seasonal heads in the breeze. Lying fallow in the midst of housing developments, shopping malls, the new movie theater — the vacant lot stands out like a knife wound on a woman’s placid face, shocking, brazen, ugly. It is always empty. Except for one thing: a ragged heap of old trash, all nasty black tar paper and vicious snarls of rusted wire, car parts and broken glass and other junkyard jetsam. The embodiment of injury waiting to happen, an invitation to a tetanus shot... the city never hauled it away. No one ever wants anywhere near it; it radiates an eerie sense of calculating watchfulness. And at night, it wanders. Academy StorylineSix years ago, a sixteen-year-old boy dreaming of adventure and exploration stumbled upon an empty academy. The dark magic pulsing through the air pulled him in, and he discovered a library full of strange, forbidden texts of deadly and vicious spells. The halls of the academy's grand castle echoed with silence, and not a single footfall--except his own--marred the snow steadily falling. The buildings surrounding the castle and library were all locked, and though he had the ability to shift under doors, he found himself unable to pass through their gates. All he could do was peek into windows into dark, dust-covered rooms, and wonder how it is this place became abandoned. One by one, the boy's friends followed him to the academy, and as they appeared on campus, the place slowly started to come alive. Ancient bulbs lit, bathing dark hallways in their glow, though an evil force hinted its presence through flickering lights and sensations of unease. The Hole in the FenceEveryone knew about the hole in the fence. You went to the back of the park, where the grass gave way to packed dirt, and followed the fence east until you found it. You didn't even have to crawl on the ground -- you could just walk right through the space where the chain links had been torn away from the post. When Tina was little, too young to go to the park by herself, she asked her big brother what was on the other side. "What do you mean? You can see through the fence already." And he was right. On the other side lay more dirt, and then rocks that eventually led to the foothills. But there was still a mystery about it all. There were rumors of a cave, and of small blind animals that lived in the crevices of the rocks. Keep walking dear maiden, through the endless dark forest. Quickly now, find all the notes. One is on a tree, deformed and intimidating, but don't ever forget to look around for me. Hurry now, I'm getting closer. Keep running my dear, either way you'll never leave. Just stop moving, it'll all end faster. Now fair maiden, you are mine. My queen, with skin fair as snow. Your face is gone, replaced with a silver glow. Your clothing, composed of an elegant black dress, and now my White Queen, let us slaughter the rest. Fragile--FFM Day 7Lindsey Stirling blared from my ear buds and I bobbed my head, furrowing my brow. My hand was shoved deep into my purse, searching for my keys. Instead, I found receipts from the Stone Age, a collection of seashells from last year's vacation, and enough pepper spray to blind at least twenty bears. Frustrated, I dumped my portable landfill on the welcome mat; lipstick tubes and loose change bounced across the wood and disappeared, lost beneath the porch. Spreading objects out with my hands, I sighed. No keys. "Damn it all to Hell and back ag--"
Glancing up, the box near my door caught my eye. Wrapped with neon-colored paper, a large skull-and-crossbones bow held a handwritten "FRAGILE" note in place. The colors were garish, clashing with the ivory siding. Wrinkling my nose, I pulled the package toward me, keys forgotten. The paper was slick, slipping against the pads of my fingertips like silk. Examining the box, I flipped the "FRAGILE" note over--and gasped. HungerThe fox had been hungering for quite some time: its fur was growing thin, a dull blanket over starving ribs, and it walked with the careful steps of one who has but little strength to spare. It limped as it walked, for its left forepaw had been hurt some time before by the trap of a hunter. It had escaped the trap with its life intact: but now it hungered, and could no longer hunt. Today it had caught a carrion scent on the breeze, sweetish, cloying: the smell of rot. It was a hope, and the fox was limping towards it as quickly as its meager strength would allow. Surely it could find something to scavenge from a kill so old. By now, I'm sure you've played Black or White. You've marveled, or scoffed, at the new pokemon, beaten the gym leaders one after another, gasped at the plot. You've been to Nimbasa City. You rode the ferris wheel there with N, didn't you? If you were playing a girl, perhaps you giggled to yourself about N's rather flirtatious dialogue. It's such a cute scene. A few days later, maybe you returned to the ferris wheel, hoping for another ride with N, to find a trainer there instead. My first one was a waitress, who invited me to a battle, and then some girl talk. 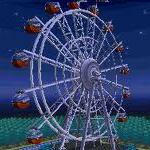 After you win against the trainer, you get to watch the animation of the ferris wheel again, and one half a conversation where they do all the talking and you, as usual, are silent. It's not N, but who would turn down a daily battle? You need to train your pokemon to the top after all, and every little bit helps. Forgotten ALICEI've always loved Pokemon. All the games...and I've collected Pokemon cards ever since I was a little girl. My favorite game, out of all of them, was the special Pikachu, Yellow version. My aunt gave me a Gameboy Advance for my birthday, when I was about 5. With the gameboy, I got 3 games handed down to me from my cousins: Harvest Moon, Tony Hawk, and a Pokemon Yellow version. First I played Harvest Moon, practically the whole time my relatives came to visit. I loved it, I played it for hours. Finally, I beat the game and I was bored. I popped the Pokemon Yellow into the cartridge without a thought. The game started up with Professor Oak giving his speech about Pokemon. I named myself ADA and went on. The game progressed completely normally. No glitches, no hacks. Finally, I got the Pikachu you run into when you walk into the grass. When it asked me to name Pikachu, I immediately called the Pikachu ALICE. I've always loved that name.